HellyTelly is a boutique aerial drone-filming facility based in the North West, just south of Manchester and close to Media City. Our work has included everything from Reality TV and travel documentaries through to films for national charities, corporate video and commercial stock-taking and building surveys. The HellyTelly team comes from the worlds of broadcast TV production, commercial aviation and advertising, so we have a range of experience on offer. Our drones can deliver high-resolution stills, 360 VR images and of course, video. We fly a camera with a super-35mm sensor and which delivers up to 6K HDR pictures with nearly 14 stops of dynamic range. Do get in touch with us if you'd like more information or a copy of our free 'Working with Drones' information sheet. A commercial for Butterkist Popcorn with a roof-level lifting end shot. It might have been more traditionally shot on a tall cherry picker or crane – but a Drone made it cheaper and simpler. Bedford Kerrang band Don Broco made this video for their album “Automatic”. Produced by Chief Productions in Manchester – we filmed the aerials on an appallingly wet day which almost had us grounded! We filmed the aerials for this Chief Productions Video with some famous Man United faces that you might just recognise. Shot in tricky conditions, the safety considerations were high up on the list that day. Whether you decide to use HellyTelly or not – we’re always happy to talk and give advice and information. Or if we don't know the answer to your question, we'll try and find you someone who does! We’re based in North Cheshire / South Manchester – but we’re happy to travel. In the past 5 years, we’ve filmed all over the country – from Poole Harbour on the South Coast to the West Coast Islands of Scotland. There's rightly been a lot of talk about Drone safety recently. We follow a strict operating procedure that is vetted each year by the CAA and allows us to hold the CAA's 'Permission for Commercial Operation' or PfCO as it's often known. Our pilots have passed a CAA approved UAV pilot exam, and we carry out a thorough risk assessment before each job. Where necessary, we will talk to the local air traffic controllers and liase with them before and after the flight as required. We also carry the routine Public Liability insurance of £5 million. Our team has extensive broadcast safety training and we regularly review our operating procedures to evaluate safety issues. Even when there are challenges to safe working, with the right planning and preparation, we can often find ways to get you the great pictures you need. We have various drones and cameras for different tasks. Our current favourite camera is the top-of-the range DJI X7, which has a Super 35mm sensor and delivers a very impressive 14 stops of dynamic range with 14 bit images. With a new colour gamut and a D-Log gamma plus a set of prime lenses – the X7 has been compared to Red and Arri cameras. It really does deliver very nice pictures using Pro-Res 444XQ or RAW DNG formats which offer a flexible workflow and plenty of dynamic range for grading. We fly the X7 on a DJI Inspire 2 drone with nearly 20 minutes flight time per battery set. We’re big fans of the Inspire 2 as it has twin power supplies along with redundant command and control electronics. 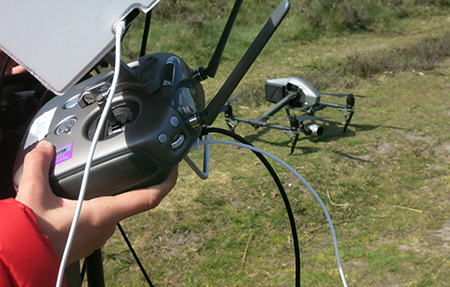 We’ve found it to be a very safe and stable camera platform – even in very gusty winds. We also have a couple of smaller drones for those run and gun situations where you need very fast set up and break-down. In the right conditions, they can deliver great pictures that will fit into any broadcast or corporate film. They’re also very handy for flying inside buildings like factories, churches or laboratories. Other standard facilities we offer include a portable DIT kit for backing up rushes on location; a 2.5Kw generator for location charging - and a large Atomos SUMO 19 director's production monitor with sunhood so you can see exactly what pictures you’re getting. We also have a handy Guide for Production Teams which set out some of the preparation and planning issues involved in Drone filming. If you’d like a copy, please just ask. As well as aerial filming we can offer side-by-side conventional lighting camera in HD or 4K and can include various lighting and audio packages. Check out our sister company PictureWise Productions. To find out more about the possibilities of using a drone for your project – or just to get some idea of what’s involved – please use our contact form, or do call us for a chat.